SAN JOSE, CA--(Marketwired - Jul 14, 2014) - The Silicon Valley Cannabis Coalition has secured vouchers for 30,000 free medical marijuana evaluations as well as over 45,000 vouchers for free grams of medical marijuana. The group plans to pass the vouchers out to San Jose residents over the next 3 days. Starting today the group will also be putting on an "occupy style" protest at San Jose City Hall for the remainder of the week. All patients, collective employees and community supporters are urged to attend the protest and to sign a petition for a referendum that would stop the city from closing collectives in just 4 days, on July 18th. "The city's polling proved that over 80% of San Jose residents do not want to ban collectives," said John Lee, Director of the Silicon Valley Cannabis Coalition (SVCC). "So instead of banning collectives outright, the Mayor decided to make it impossible to operate them, and that's what we're fighting against." Activists claim the regulations supported by Mayor Reed put hundreds of employees out of work and endanger neighborhoods by pushing marijuana sales back to the "black market." This "market" for marijuana will not ask for ID or medical recommendations, and will make it easier for children to access marijuana. San Jose's new regulations require all medical marijuana concentrates, edibles and topicals be produced on-site, by the collective; something that's virtually impossible for the dozens of businesses currently operating in the city. Medical marijuana vendors statewide will not be allowed to provide any products to collectives in San Jose. Outdoor growing is banned as are medical marijuana patients ages 18 to 20 from working at, or even getting medication from, collectives. "While the mayor claims there are 'hundreds of potential locations,' the fact is, even in the best case scenario, it would be hard if not impossible for anyone to operate a club under these new regulations," said Dave Hodges, founder of the All American Cannabis Club (A2C2). "And of the potential locations, only a handful are available to lease for a cannabis club." Who: All San Jose medical marijuana patients, supporters, collectives and their employees and community supporters are invited to attend. 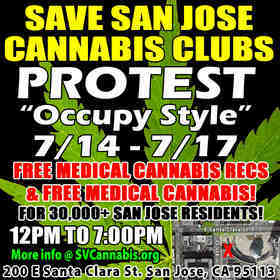 San Jose residents will stage an occupy style protest in front of City Hall this week to show their dislike of the city's plan to shut down dozens of medical marijuana collectives in the city.